Today's high performance devices generate significant amounts of heat. Excessive heat is the enemy of any high performance device and leads to a shortened life. Thermal Interface Materials (T.I.M.) use metal oxides to assist transfer of heat from source to heat dissipater For dispensing, T.I.M. is available in two general formulations - grease or an adhesive T.I.M. is supplied in a 30 to 55 cc syringe or larger cartridges. Thermal grease is used when a thin bond line is required and no holding power is needed, aka, fluid does not cure. Alternatively, when a larger gap or holding power is required, a thermal adhesive is the recommended solution. Metal oxides are key to heat transfer but are highly abrasive; they can shorten dispense pump life. Thermal greases, being more "slippery", work well with a PCD Volumetric Series of pump. Grease properties allow metal oxides to shuffle through the pump with minimal wear. Using PCD series of pumps provides drool-free, repeatable dispensing at a high flow rate. A Precision Auger Pump may also be used, but due to grease composition, fluid control is trickier when working at high flow rates. Thermal Adhesive and Grease Dispense with Precision Auger Pump. Thermal Grease with Volumetric Pump - video. Thermal adhesives, on the other hand, have larger size fillers and do not have the lubricating properties of a grease. Because of this, fillers do not slide through the pump, so higher levels of wear result. To accommodate higher abrasiveness, a Precision Auger Pump with a relieved carbide auger is the recommended solution. Precision Auger Pump configured with a 186 auger is a double helix auger machined from carbide and connected to a high-torque, high-RPM motor. Due to abrasiveness of the fluid, auger diameter is customized to accommodate fluid fillers. If fillers are not taken into account, an excessive amount of grinding will lead to eventual damage and excessive auger wear. Thermal Adhesive and Grease (Lid Attach Process) with Precision Auger Pump - video. A common dispense process using both a thermal grease and a thermal adhesive is Lid Attach. There are two different methods of Lid Attach on FCBGA: Single Piece and Two Piece. 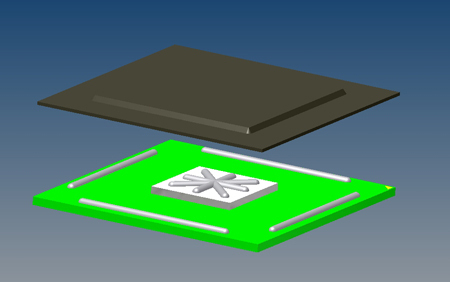 Single piece heat dissipater attach consists of a single, formed heat dissipater that interfaces with top of the flip chip via thermal grease and FR4 base substrate via an adhesive. Thermal grease and adhesive need to be dispensed in specific, customer-defined patterns designed for the best interface for heat dissipation. Repeatable TIM dispensing is required for uniform material coverage after heat dissipater is placed. Non-uniform material coverage will result in varying thermal dissipation and could lead to product failure. Dispensing adhesive that actually secures the heat dissipater in place is also key to avoiding excess fluid outside of package which, although it does not affect package performance, is a cosmetic flaw. Too little fluid may result in a faulty package where separation could occur. Two piece heat dissipater attach is similar to single piece heat dissipater process except for the addition of a stiffener to main heat spreader or lid. The entire process adds an additional step of dispensing adhesive for only the stiffener. Once adhesive has been dispensed, stiffener has been placed, and adhesive has been cured, the entire package is returned to the reconfigured production line where two fluids are dispensed as is done to single piece heat dissipater. The most popular platform for high volume lid attach process is MAX Series. MAX systems can be configured with two pumps and can interchange between pumps during program. Our Weight Calibrated Shapes software routine allows for the quickest program setup time. Depending on process set up, an additional MAX system can also be used to place heat dissipaters. DS Series is a great system for R&D environments. It is an all-in-one platform that's great for process development. This system may be configured with two pumps and a Pick & Place head to place heat dissipaters (see graphic 1). Our Weight Calibrated Shapes software routine is available for quick process set up. Nozzle selection is an important component of high dispenses rates. For thermal adhesives, our precision nozzles are designed with a large ID to funnel fluid to the dispense surface. Additionally, nozzle is positively attached to cartridge so it withstands high pressures generated between auger and nozzle. Final dispense diameter only at tip. S Type taper tips are recommended for grease applications. Taper geometry controls pressure build-up and fluid flow. The result is a clean dispense with a uniform dispense pattern and no tailing. To aid in program setup, use our innovative Weight Calibrated Shapes software routine. This feature allows operator to program a complex dispense pattern - consisting of lines, arc, dots, etc. - with as many features as required. During pattern setup, a base pump speed is defined, then desired weight for dispensed pattern is entered. The program is run and system records pump starts, pump stops, and movement time between segments. These starts, stops, and delays are then duplicated at the weight scale. The system adjusts pump speed to attain desired weight. Each dispense pattern used in a program can be calibrated to a specific weight or just to a specific pattern. This feature greatly reduces setup time and allows engineers to (1) make adjustments to the dispense pattern while maintaining the desired weight or (2) adjust the weight with the same pattern. The operator does not need to perform trial and error program adjustments to reach desired weight. Couple our Precision Auger Pump with Real Time Process Control System (FPC) to take your pump performance to the next level. Real Time Process Control is a breakthrough in uniform fluid dispensing. It ensures a constant supply of fluid is available to the pump regardless of reservoir size or fluid level. FPC monitors pressure of fluid entering dispense pump and makes adjustments to reservoir feed pressure, resulting in a consistent feed to the pump.